Thank you for taking in an interest in Discovery Dome's exciting presentations. These are some of our most popular shows. We do however have much more material that we use so please do contact us for a discussion as often we can tailor make a show to suit your requirements. 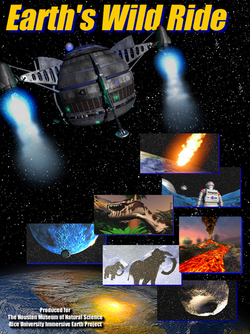 We use many 360 degree simulaions and animations and clips to build an exciting session inside the planetarium. All sessions are led by experienced international school teachers. We encourage children to ask questions and time is given for a Q and A. ​There are disturbing indications that Earth is warming up; increased global temperature, variations in frequency and intensity of rain, extreme meteorological phenomena, ice retreating of glaciers and the North Pole and advancing desertification. Earth experiences periodically altered climate, with periods of ice ages and warmth, even in the last millennium. Some scientists say these are natural periods with climate variations due to solar activity changes and orbital variations of the planet. However, other experts claim that Man is primarily responsible for current climate changes. In this sense, it was found that since the beginning of the industrial revolution there has been polluting gases detected and temperature rise across the globe. Lately, the impact on Earth has taken on major proportions it seems. The massive use of fossil fuels (coal, oil), extensive breading of cattle, the disappearance of forests, and the great expansion of rice cultivation has skyrocketed the gases in the atmosphere; i.e. "greenhouse gases" such as CO2 and methane, with the possible effect of increase in global temperature. The effects are already noticeable. If persisting, this trend may upset the natural system of distribution of heat on Earth, causing the total melting of Greenland and Antarctica, causing a significant rise in sea level that would flood coasts and coastal cities. Desertification that would vast areas could also be triggered causing the extinction of natural habitats, animal species and even indigenous populations.Man must investigate and attempt to redirect these alterations caused to the global climate by using cleaner energy and conserve the ecosystems attempting to compensate for the emissions of greenhouse gases. This requires the involvement from every instance of society; political, business as well as individual. ​A little over 400 years ago, using Dutch lens maker Hans Lippershey's invention, Galileo started a revolution. Turning his crude "spy glass" telescope skyward, he recorded the wonders he saw and change the world forever. Four centuries later the telescope has evolved into modern wonders of technology like the Hubble Space Telescope. Join two young astronomy enthusiasts and their astronomer friend as they explore the universe and learn why telescopes are such important tools of science. Concepts: Design and nature of telescopes, historical overview of astronomy, spectrum, optics. • Compare reflection to refraction. • Explain how the shape of a lens or mirror can affect the image quality. • Explore the history of telescopes from Galileo to the Great Observatories. • Describe how technological advances have improved telescopes. • Describe how science has advanced the technology associated with telescopes. SECRET OF THE CARDBOARD ROCKET this show especially suits ages 5-9 however older children are still captivated by the great soundtrack and stunning visuals. Oasis In Space- suitable for audiences aged 8 and above. and solar system in search of water and water worlds like Earth. 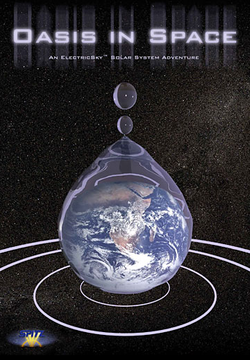 Earth is a very special planet because it has liquid water, and can therefore support life. Water: our most precious resource. Without it, life could not exist on our planet. Is the reverse also true? If we search for water, will we also find life? Join us as we explore our solar system and discover what makes our world stand out among the Sunâ€™s family of planets. Stunning imagery will captivate you as we journey to, and sometimes even below, the surfaces of our neighbour worlds to discover whether or not life might be possible beyond our home planet. For pre show and post show activities please download the teachers guide here. To see a short clip of this movie click here. ​In case you haven’t heard, the Moon is trending again… and in a big way. Like in the glory days of the 1960s and 1970s, our big white space neighbor is enjoying the attention of lunar explorers. Only this time, they’re going back to the moon for good. The educational 24-minute Google Lunar XPRIZE full-dome planetarium show, Back To The Moon For Good, chronicles teams around the world competing for the largest incentivised prize in history, by landing a robotic spacecraft on the Moon for the first time in more than 40 years. To win the Google Lunar XPRIZE, a team must land a robotic spacecraft on the Moon, navigate 500 meters over the lunar surface, and send video, images and data back to Earth. This global competition is designed to spark imagination and inspire a renewed commitment to space exploration, not by governments or countries – but by the citizens of the world. Show SynopsisThe show opens with the first era of space exploration in the late 1960s and early 1970s. We see what that era of landers and orbiters taught us about our nearest neighbor including the discovery of the Moon’s origin, composition, structure and the accessibility of raw materials on its surface. The Google Lunar XPRIZE is introduced as the largest incentivized competition to date, designed to democratize space and create new opportunities for eventual human and robotic presence on the Moon. We see the engineering and innovation steps taken by the internationally distributed teams competing to land a spacecraft on the Moon and vie for additional prizes. We highlight the human spirit of competition and collaboration as teams take on this audacious challenge. Who will win the $30 million Google Lunar XPRIZE? The audience is taken through a successful launch, landing and lunar surface travel. The show ends with a stunning glimpse of a plausible scenario for our future on the Moon. Imagine Earth were a distant place you once called home but could never visit again. What would you remember most about the planet, and how would you describe it to your grandchildren? This is an amazing educational IMAX style immersive 3-D film about moments in the Earth's history, with the ice age, asteroid impact, dinosaur extinctions, volcanoes, atmosphere, water cycle and rivers, as pictured from an imaginary Moon settlement during a solar eclipse in 2081. Saturn is the true "Lord of the Rings". After nearly seven years in transit, the two-story Cassini-Huygens spacecraft began orbiting Saturn on July 1, 2004. Cassini continues to explore Saturn and its moons during its extended mission, while the Huygens probe had landed on the surface of Titan, Saturn's largest moon. The Cassini Saturn encounter began with a flyby of Saturn's farthest moon, Phoebe. 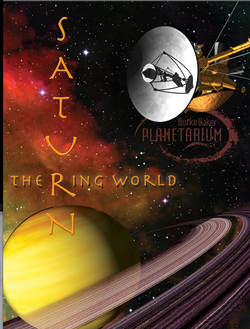 See Saturn up-close and all-around-you inside our dome theater. Ring World is narrated by Star Trek's John Billingsley (Dr. Phlox on ENTERPRISE) and was produced by the Houston Museum of Natural Science and NASA's Jet Propulsion Laboratory.